Believe it or not, people can indeed have mythical animals as totems. 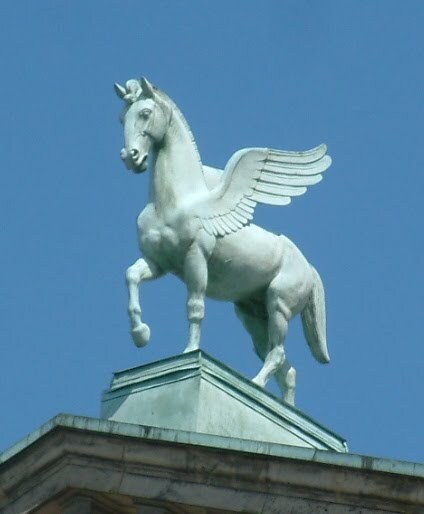 In this case, Pegasus refers to any winged horse. This totem will give you inspiration, quick and agile wisdom and the ability to fly over any situation. He can be a helper with astral travel; and a protector during your travels. Can help change evil into good. If you are feeling down, call upon a Pegasus, or if you attempting any sort of travel. I think that if you are attempting astral travel for the first time, you should call upon a Pegasus to help you, as it can be a very emotional and taxing time. One of my best friend's has an unicorn as her animal spirit guide. She says that it makes her feel hopeful and forever young. My animal spirit guide is quite mundane, but full of power. I always thought it was a wolf, but sometime ago, I got a better look and realized it was dog. Since then things have been a lot clearer for me. Mine is a housecat. A kitten to be honest. My friend has a giant squid.